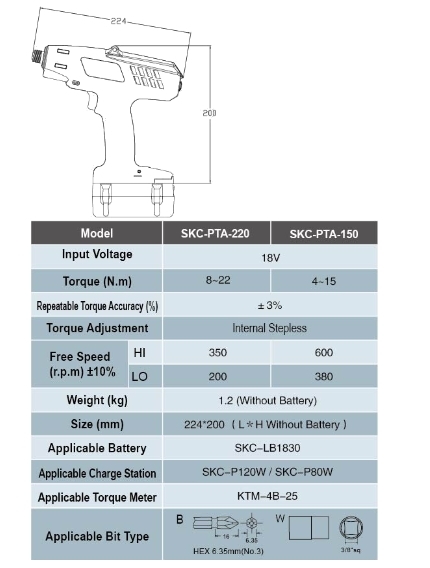 · The high power brushless motor was researched, developed and produced by Kilews, with 2 year warranty. 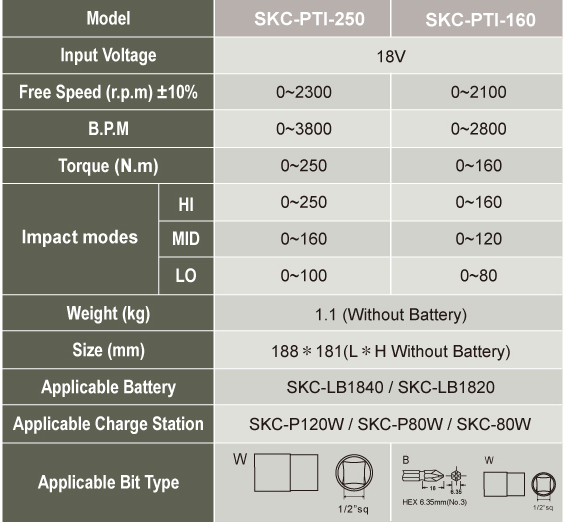 · Adopting Japanese high performance Lithium-ion battery which has longest standby time and lifetime. · The cordless screwdriver will warn when low capacity. The red LED will flicker when 20% battery capacity and bright continuously when 10% battery capacity. User can be reminded to replace the battery by the LED. · The cordless screwdriver will indicate operating correctness. The green LED will be bright and once short alarm per correct fastening screw. Conversely, the red LED will be bright and once long alarm, about 1 second. · Illumination aide is under front shell. When using cordless screwdriver, the LED helps user work in darkness. 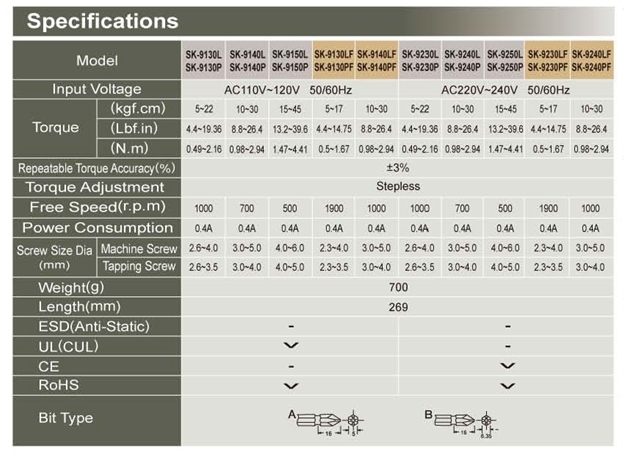 · The user can base on the requirement to select HI/LO speed via the electrical switch. · In order to hold the cordless screwdriver comfortably, the shape is designed to be 10 degrees elevation and balanced as good ergonomic. · Attaching the torque identification rings to distinguish the torque after the user adjustment. Also attaching the waist hook, side handle, suspension ring and wrist band to help the user easy to use. 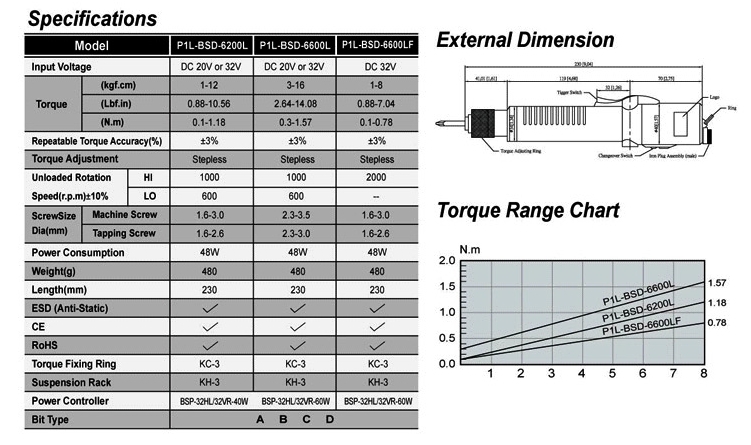 · 5 steps of torque adjustment with LED indication. User can set torque output according to their requirement to prevent unnecessary hammer consumption. Fastening status will also be shown on LED indication. · Ergonomic grip design for comfort operation and reduce operator fatigue from long time operation. 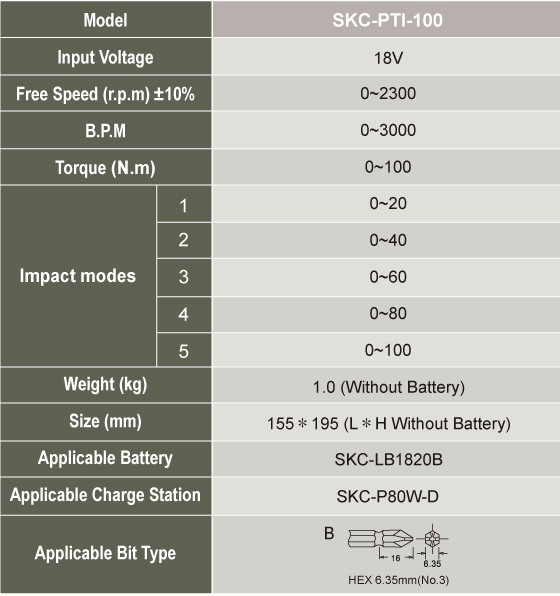 · The high power brushless motor was researched, developed and produced by Kilews, with 1 year warranty. · The best choice of industrial production and assembly with heavy instant beat, can reach 3800 times per min. Best-suited for fastening the big nut for heavy industrial. · The maximum torque can reach to 250 N.m and applicable for heavy industry assembling. · Adopting Japanese high performance Li-ion (Li-Mn) battery which has longest standby time and lifetime. · The cordless battery screwdriver has beep warning when the battery power caoacity ia low. The red LED will flicker when 20％ left of battery power capacity and light up continuously when 10％ left of battery power capacity. User can be reminded to replace the battery by the LED warning light. · The user can base on the requirement to select HI/MID/KO torque forces via the electrical switch to prevent unnecessary hammer consumption. · LED illumination, LED will light up while screwdriver is operating to help user to see the fastening object status and to make sure the screws are aimed to exact positions. · In order to hold the cordledd battery screwdriver comfortably, the shape is designed to be 10 degrees elevation and balanced as good ergomomic. · In order to extend battery operating time, the cordless screwdriver will turn to sleep mode automatically when it idled over 3 seconds. Sleep mode helps to save electricity and extend battery life time. 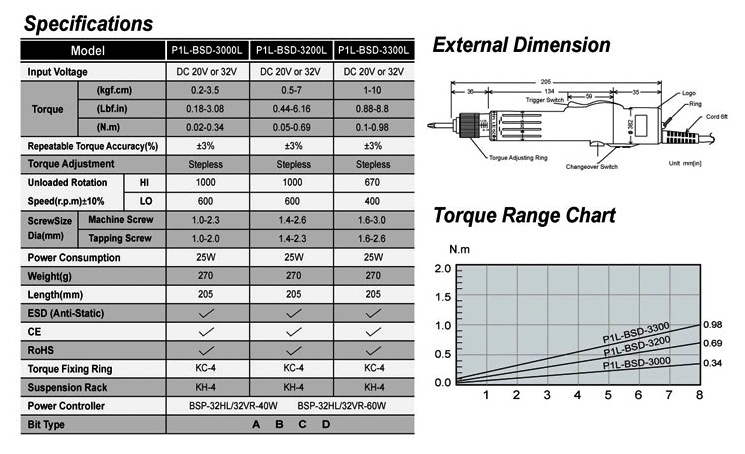 The torque meters are directly produced in Japan, authorized by Kilews Industrial Co., Ltd by ODM. Each product will be provided with an Adjustment Certificate and one year Warranty in normal using. *KTM-CSH is for RBN/TBN 6~18N.m and BN900 series. *KTM-4-B-25 / KTM-250 is for RBN250 series. These measuring instruments could not be applied in testing the pneumatic screwdriver products and prohibited in measuring the torque exceeding maximum measuring range of torque meters. · New technology, fully automation, as fastened screw reaches preset torque, clutch will stops immediately. · Freendly holder, free from fatigue under long-time using and improve production efficiency. · Low-voltage with power controllers, no infulunce by fulctuated voltage can keep long-time operateion. 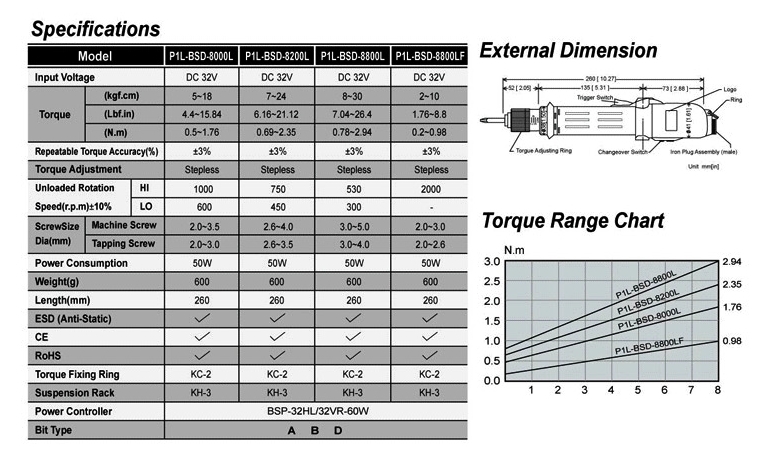 · Precise torque, torque adjusted from small to large, stepless and stable. · Rotation speed can select by switch Hi & LO or adjust freely by VR. · Complete SERIES TO PROVIDE FULL TORQUE RANGE (0.2~48kgf.cm) for all general applications such as cel phone, digital camera, PDA, DVD, Notebook, PC, office machine and other peripherals, etc.